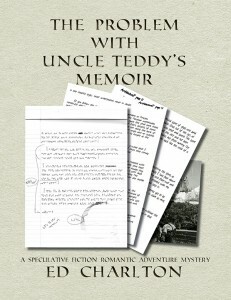 The Problem with Uncle Teddy’s Memoir: A Speculative Fiction Romantic Adventure Mystery by Ed Charlton. So, you’re thinking e-books have replaced print books… Here’s a book definitely read best in print; the look of every page is part of the story! Technically, this is an epistolary novella–a story told through letters, notes, e-mails, and manuscript pages. And if you didn’t know it, the author is doing something rare, and, in sci-fi, even rarer.